If you're seeking a serene natural retreat, a skate park's probably the last place you would look. 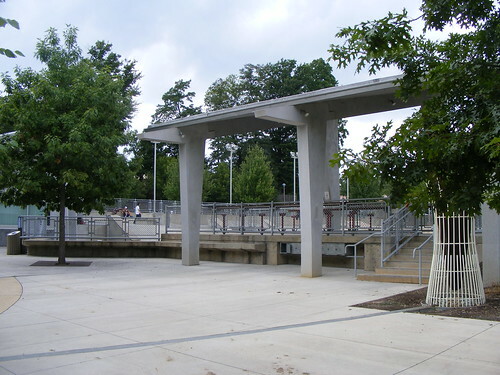 But a few years ago in Arlington, the county built a park that welcomes all visitors, not just those with skateboards. 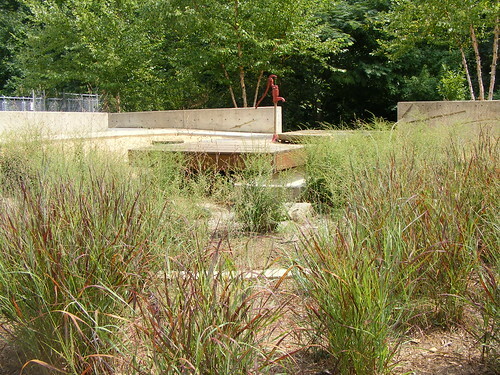 A few weeks ago, I visited Powhatan Springs Park, also known as the "skate park rain garden." Designed by local architecture firms the Kerns Group and Oculus, it combines a skate park with a rain garden and a soccer field, creating a space that welcomes all visitors. 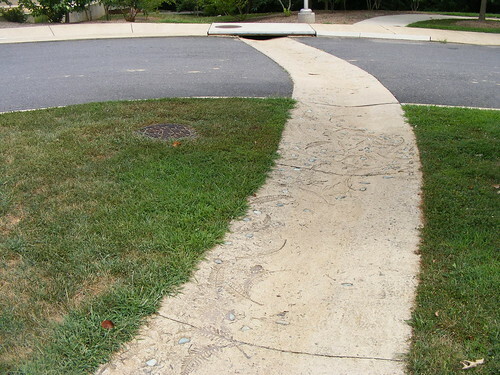 It's no surprise that the project was given an award for "innovative excellence" by the Maryland and Potomac Chapter of the American Society of Landscape Architects in 2005. Powhatan Springs is located on busy Wilson Boulevard in Dominion Hills, a neighborhood at the far western tip of Arlington. It's a diverse area with a mix of single-family homes and apartments; Eden Center, the Vietnamese shopping mall, is a mile away. 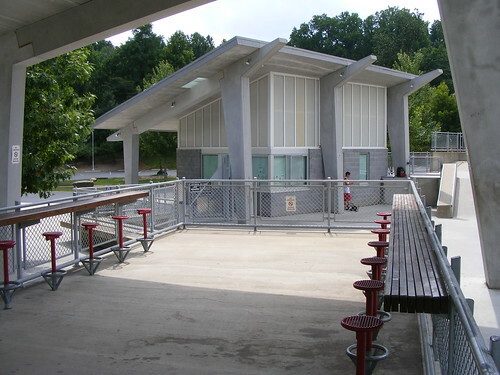 The park is well-served by bus and trails, ensuring a steady stream of visitors. 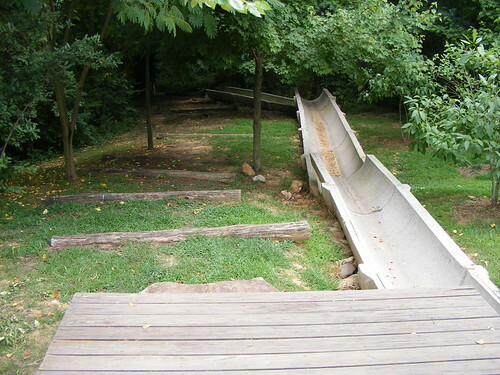 As a result, the park has to accommodate a variety of uses. Along Wilson Boulevard, there's a concrete skate park with a bowl that mimics a swimming pool. Next to it is a soccer field with spectator seating. Behind them is a small parking lot and an interactive rain garden, which collects and absorbs stormwater rather than dumping it into a drainage system. This culvert carries water down into Four Mile Run, while an adjacent path connects the park to the surrounding neighborhood and a nearby elementary school. All the concrete in the skate park can be hard on the eyes and amplifies sound. Meanwhile, the rain garden is filled with lush native grasses. 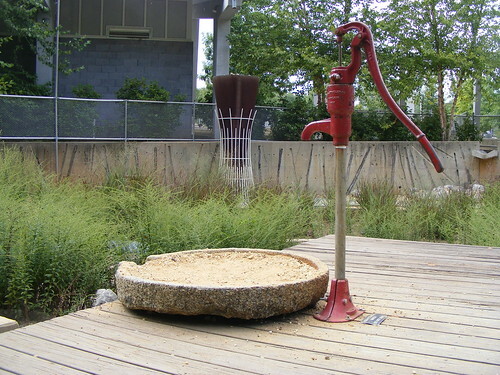 The rain garden has a pump where kids can play with water. It was meant to be a "sort of unprogrammed, unstructured [space] where you created your own fun, in the words of project manager Robert Capper. The pump wasn't working on the hot, dry day that I visited, but presumably it's quite popular the rest of the time. 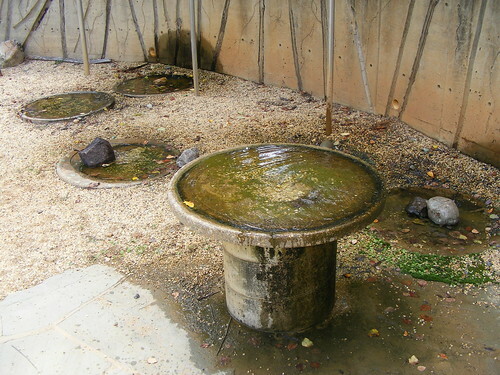 However, a set of pools and a cistern that collect rainwater were fully functional. The garden motif continues out into the parking lot, where the concrete drains are stamped with leaves and twigs. 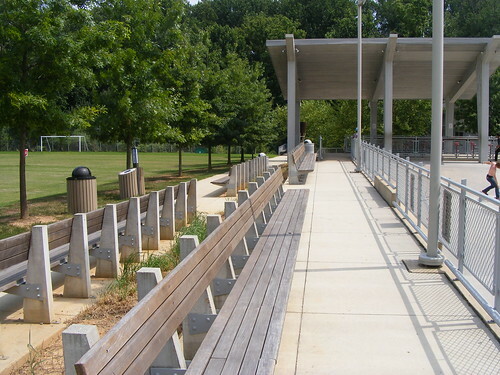 Between the rain garden and the skate park is a little plaza with a bench, giving kids a comfortable, dignified place to sit and wait for a ride. 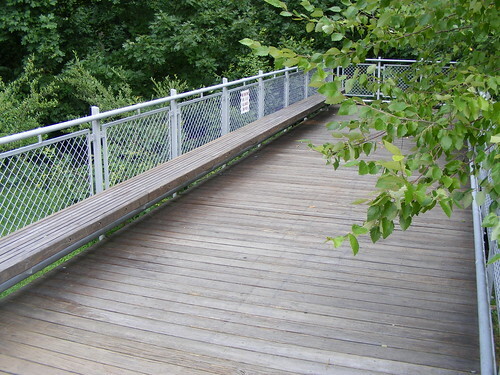 There's a "pier," set in the trees and overlooking the rain garden. This is the most secluded space in the park. Depending on how concerned you are about crime, it's either a quiet refuge from the outside world, or a hideout for illicit activities. Hopefully, the park is busy enough to keep this area safe. There's two rows of spectator seating, one each facing the skate park and the soccer field (at left). There's also a "cafe," which has a bar and stools for eating. This space gives people a dedicated place to eat with trash cans, so the soccer field and skate park aren't littered with food wrappers. The views from here are pretty exciting. There are three concrete structures framing the skate park. They hold the cafe, a storage/maintenance shed and a manager's office. They're simple but attractive, helping to define discreet areas within the park as a whole without standing out. The manager's office isn't always staffed, but a list of posted rules is visible for all users. It's a good sign that the parks authority feels comfortable leaving the space unattended, because it suggests that visitors are taking care of the place. And they are. The park is clean and the skaters were friendly to each other and to me when I asked to take pictures of them. There were a couple of groups there ranging from high school age to a little kid with his parents, and everyone got along fine. 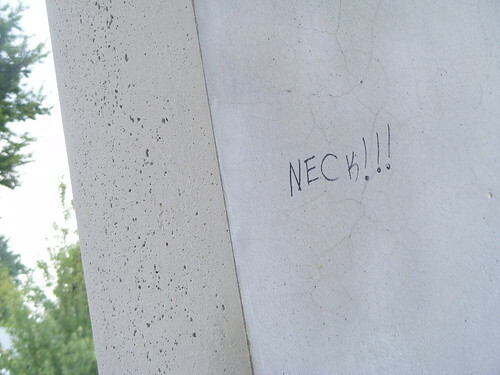 The only vandalism I found at Powhatan Springs was a little bit of marker scribble in the cafe area. That's impressive, especially considering that a recently-opened skate park in Howard County was soon covered in graffiti, though officials there decided to keep it as a form of "urban art." I think it's great if a community decides to embrace graffiti at their skate park, as the two are often misunderstood forms of artistic expression. But it's also great if the users of a skate park can respect a prohibition against graffiti and still take care of the space they're given. As skateboarding becomes more popular, the need increases for more skate parks. 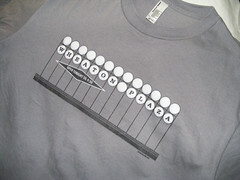 However, many communities are hesitant to give skaters a chunk of the public realm, fearful of noise, crowds and crime. 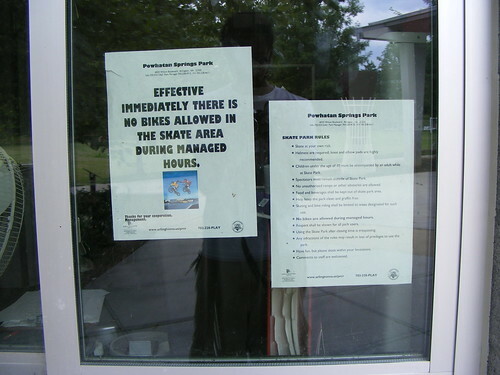 Powhatan Springs Park shows that you can give skaters a home without scaring off other users. It's an example that more places should follow. 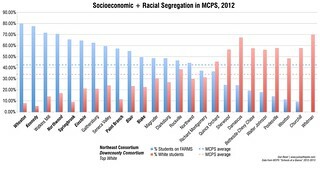 I agree with the blog you linked to regarding the Howard County skate park graffiti. It actually brightens up the place. I'm glad the County decided to leave it, except for obscene stuff or gang signs.